A semi-abstract gouache (opaque water-color) painting, of a dreamy landscape. Dream Forest Gouache on Paper. Oil on canvas signed 'Nina' - 1960s Romania in very good condition. Completed in 2018. Forest Pond. A semi-abstract ink painting, of a dreamy landscape. IT IS SIGNED IN ENGLISH AND JAPANESE ON LOWER LEFT. DONE IN COLORS OF BLUE, WHITE, RED, YELLOW ETC IN EITHER OILS OR ACRYLICS ON STRETCHED CANVAS. DON'T MISS THIS OPPORTUNITY TO OWN THE ORIGINAL ARTWORK OF T. Denver ! With a unique style, Denver's works are sure to take your breath away. ". Lily Pond " is an original oil painting on stretched canvas, hand signed by the artist, and it's ready for a framing of your personal prefernce. Title: " Bamboo, Quick sketch ". 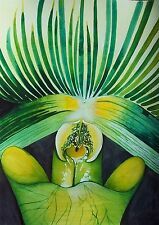 Presenting a new original watercolor painting from the artist, Natalie Komisarova. Materials: watercolor, paper. For many years I’ve been engaged in painting. I am a graduate of the Academy of Arts and professionally trained in painting and drawing, as well as graphic design. This is a scroll which you can hang on the wall as it is. Painting: 7 x 22" (19 x 56cm). It is hand painted on rice paper with silk mounting. Painting: 13 x 38" (34 x 96cm). This is a scroll which you can hang on the wall as it is. It is hand painted on rice paper with silk mounting, like a mat. You have found the missing pieces to your art collection! Here is a framed oil on canvas by Mario Campello of Sao Paolo, Brazil in 1974. It is 19.5" x 19/5"" plus wooden frame, and in excellent preowned condition, no chips or cracks. Please see our Not Just China Store for more artwork. By adding to painting title a painter Parfonova Anna [Parfonova AYA] in the end of google search. Feng Shui HEALING L. study of Master Paintings of the World - ean-Honoré Fragonard - The Progress of Love: Love Letters. Clean glass, watch you don't leave finger prints. When you have the matt, attach picture with tape to the mat. Place on glass. and signed. 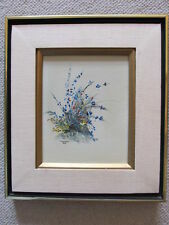 Original Nance Danforth painting. Danforth has been oil painting for over 5 decades. Danforth's works are collected internationally. ----Nance Danforth. Original paintings are created with M. Graham walnut oil paints, chosen for their high color saturation and non-yellowing nature. Original Acrylic on Canvas by Maya Eventov. Maya Eventov ~. Maya Eventov was born in 1964 in Leningrad, USSR. Her work represents modern Russian avant-gardism. She graduated from art school in 1981 at the High College of Art and Design in Mukhina. Alexander Borewko was born in Minsk, Belarus in 1960. In 1982 Borewko successfully accomplished his studies in A. Hiebaw Minsk School of Art Republic Belarus. He studied architecture and was engaged in the restoration of Russian works of art from the middle ages. Travelling to exotic places and living in Hawaii for many years got the artist interested in bold colors and the sensuous beauty of flowers, most specifically tropical flowers. Karin started teaching watercolor painting out of her studio in Hawaii and then moved to Sedona to teach there for several years. White rose. New, original oil painting. 4"x6". Oil, canvas, signed, framed. Oil, canvas on cardboard. Small size original oil painting. Hope you enjoy the beauty of simple things that are around us because that is the feeling captured on the painting. Hand-painted watercolor greeting card with original floral painting, Snowdrop Flowers, mounted on the card. The flower artwork is a single-piece work, not a print or reproduction. Original hand-painted floral watercolor painting, Pink Gladiolus Flower, mounted on greeting note card. The floral artwork is one-of-a-kind, not a print. ByJoyce Hamil. “‘I’m not being as concerned with the literal shape of things,’ Hamil states. Her art is increasingly more interpretive, while still remaining within the boundaries of a recognizable subject. Painter Suzanne Obrand, Holocaust Survivor Watercolor Painting "Blooming Garden"
RAMfish Artist is an award winning a rtist native to Southern California. Hanging Succulent Garden. Rebecca received training in drafting and drawing in Las Vegas. This small beauty was painted on acid free 140 lb. Alois Kalvoda painting "Bohemian Courtyard" c1920. Signed "Al Kalvoda" lower left. North Carolina painter P Hamlin from the mountains of North Carolina. Water Lilies. Painting - 19" x 23". Signed Original. It is signed in the lower right corner, "cb drake.". Flowers in Vase, Original painting, rare, looks like Gouache on (dark green) felt paper. 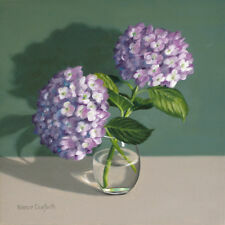 A gleaming still life painting to adorn your wall! With his skilled technique, the artist has captured the special quality of this still life. ByLaverne Siebuhr. Laverne Siebuhr (1931-2014). Original Oil Painting on Stretched Canvas. Untitled Garden Scene. Canvas Size: 16" x 20". Painting appears to be in excellent condition. Hand signed by the artist. By Starlie Sokol Hohne. Starlie Sokol-Hohne was born in 1958 in Santa Monica, California and completed her studies at UCLA in 1980. combination and juxtaposition of photographic images. First, Sokol assembles the conceived image by collaging the basic images together from the various pieces; whether a chair, or a tree or a particular sky. 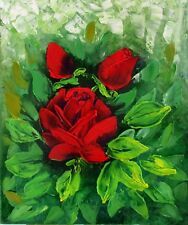 Kim Mackey "Park Roses" Hand Signed Original Oil Painting on board, floral, OBO! Special studies at Colorado State University qualified him as one of only a few certified police artists in the state. He has been a faculty instructor at the Art Students League of Denver, and has taught at the Colorado Institute of Art. He will retain the rights of each image and although the original artwork may be sold, no permission is given for copies to be made of that image. Water garden impressions 2. Oil on canvas. ABOUT THE ARTIST. In1949 he exhibited at the3rd Sculpture International held by thePhiladelphia Museum of Art inPhiladelphia, Pennsylvania, together with Marino Marini andPicasso. MAY have the best FIGHTERS in the Sport of Boxing but they do not hold this GEM IN THEIR COLLECTION. Joel M Roman, Untitled Original Gouache Painting of a garden arbor MAKE OFFER! Original Gouache Painting on Watercolor Paper. Original painting by Joel M. Roman. Joel Roman. Accademia dei Belli Arte, Bologna, Italy, studying painting and drawing under Ilario Rossi. Condition of the Painting is Excellent. My process of image creation involved working with layers of a variety of materials: graphite, assorted markers, and watercolor paint. The piece is backed with foam core/cardboard for stability and wrapped in clear cover for protection. Original Gouache Painting by Joel M. Roman. Original Gouache Painting on Watercolor Paper. Joel Roman. Accademia dei Belli Arte, Bologna, Italy, studying painting and drawing under Ilario Rossi. Condition of the Painting is Excellent. "Green Spring Stroll". One was accepted into an international show at Gallery Underground in Crystal City, Virginia. Technically, it is painting with hot wax. of the GARDENS AT GREEN SPRING - ALEXANDRIA, VIRGINIA. VINTAGE EUROPEAN OIL PAINTING . I believe that the surface the painter chose to paint on is very interesting. The painting presents a flower in a vase. Collectible Toys. We believe that the item is in good condition considering its age. Features pretty colorful bouquet of flowers. Matte is more of a forest green. Printed from a high resolution digital image on professional quality Fuji Crystal Archival Photo Paper with a glossy finish. • Wall Art For Bathroom/Bedroom/Living Room. This beautiful, fine art print was taken in Ohio in 2018. Old.has imperfections. Pictures do not do it justice.